Angela Alsawaf, Mike Ward, and daughter Sami Alsawaf made the drive from Melbourne to purchase their new 2014 Jeep Grand Cherokee. They enjoyed the process (and the price) so much that Angela referred her friend to us. And she was so impressed as well that she will be picking up her brand new Jeep Cherokee on Friday! 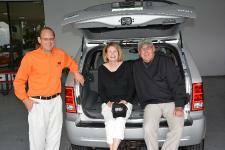 Helping with the delivery process was Kathy Poteat, one of our Chrysler Certified Sales Professionals. Thank you very much for your business. 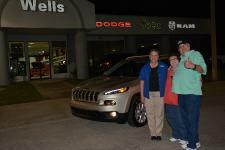 Enjoy your new Grand Cherokee! Port Charlotte is not exactly around the corner from our dealership. 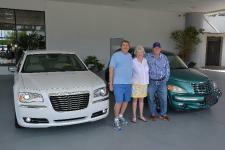 So why would Tom & Regina Brancheau drive all the way from Port Charlotte to Avon Park to buy their new Chrysler 300C? There were three reasons: lowest price, easiest to do business with, and most knowledgeable. Here they are with Dale Turner our newest Sales Professional along with their new Chrysler 300 and their 2004 Chrysler PT Cruiser that they traded in. While they do miss the 'PT' they really love the ride and comfort of the Chrysler 300C. Thanks very much for your business and enjoy your new Chrysler 300C! 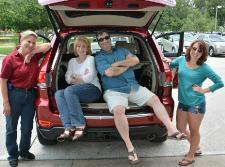 Sometimes taking delivery of a new vehicle is a family affair and it sure was for the Gonzalez family of Avon Park. Elio and Dilenia Gonzalez along with their children Alexandria, Rene, Rebeca, and Galilea. 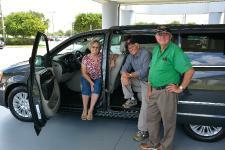 Everyone is happy, happy, happy with their Chrysler Town & Country with all its great features. 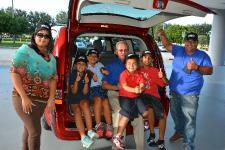 Getting right into it with the children was Don McManus, one of our Chrysler Certified Sales Professionals. Thank you very much for your business and we know you're going to enjoy your new vehicle! After searching car dealerships all over Central Florida, Elaine Mason of Lakeland found just the vehicle she wanted at the price she wanted. Here is Elaine with her husband Jay, along with Dale Turner, one of our salespeople taking delivery of her Chrysler Certified 2011 Town & Country Touring L. We know you'll enjoy your new Town & Country and thank you for your business! Christie and Ricky Graham came back down to Avon Park from Bartow to get a car for her (since Ricky got himself a new truck earlier this month). 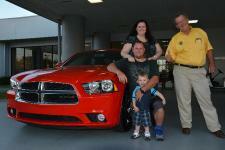 She chose a brand new loaded Dodge Charger SXT - 300 hp and 31MPG on the highway. Even little Dean thinks it's cool! Congratulating the Grahams on their purchase is Mike Pool, their salesperson, who helped them from start to finish. Quite a change for Christie, coming out of a Subaru Outback! Enjoy your new car Christie and of course, thank you for your business! Bobby Jowers (and his wife Shelia, who declined to be photographed) of Lake Wales are happy campers after taking delivery of their brand new 2014 Ram 2500 Crew Cab. 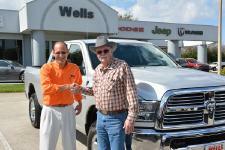 Congratulating Bobby on his purchase is Dan Craig, Chrysler Certified Sales Professional. Thank you for your business Bobby and Shelia! 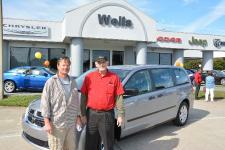 We know there are lots of dealers around and we appreciate you choosing Wells Motor Company. Ed and Justine Quimby took the two hour drive to come to our dealership to take delivery of this super clean 2005 Jeep Grand Cherokee. You can tell how happy they are to be new members of the Jeep Grand Cherokee Fan Club. Dan Craig, one of our Chrysler Certified Sales Professionals, helped to make the delivery go smoothly. Thanks Ed and Justine for your business and enjoy your Jeep! 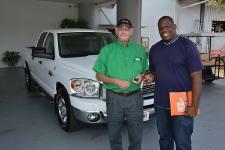 Coming all the way from Miromar Lakes, Florida to take delivery of a brand new 2014 Dodge Grand Caravan was Neal Austin. Another savvy shopper, Neal did a lot of checking around before deciding on making the trip to our dealership to purchase a new Grand Caravan. He especially liked the fact that we do not charge any dealer fees. Bill Fishman helped Neal to get in and out of our dealership quickly, making the delivery process as smooth as silk. Thank you Neal for your business. Enjoy your new Grand Caravan. Robert Craig of Port Charlotte did a lot of research before deciding to order his new Jeep Wrangler Unlimited from our dealership. Not only did he like the price, he especially enjoyed not having to pay any Dealer Fees. 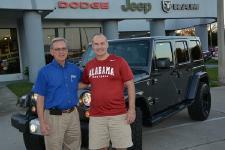 Don McManus, one of our Chrysler Certified Sales Professionals was on hand to deliver the new Jeep. Thanks Robert for your business! Rev. Alexander Scotland of Disciple Driven Ministries in Port Charlotte takes delivery of a 2009 Dodge Ram 2500 with the Cummins Turbo Diesel engine. The ministry had a Ram 1500 but it wasn't able to pull all the food that they were collecting to feed the needy. We are happy to have been able to help this most worthy cause get a vehicle that can now collect more food each week. Helping Rev. Scotland with the delivery process is Bill Fishman, one of our Chrysler Certified Sales Professionals. Our best wishes go to Rev. Scotland, Disciple Driven Ministries, and their work to help those who are less fortunate. 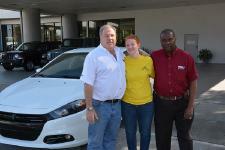 Sheryl Canright of Avon Park is all smiles as she takes delivery of her brand new 2014 Dodge Dart! Helping her with the purchase process (l to r): Jeff Grossman, our Business Manager and Lorenzo Williams, one of our Chrysler Certified Sales Professionals. Thanks Sheryl for your business. Enjoy your new Dart!